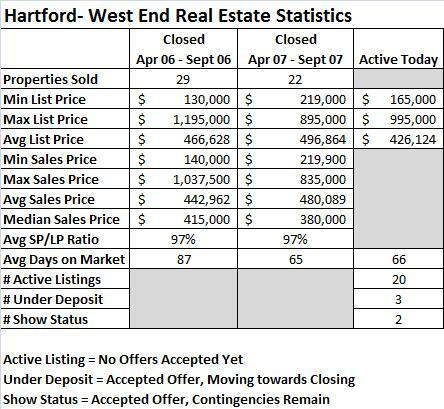 Continuing on with real estate statistics for local areas, here are the most recent stats for Hartford’s West End… All of the data is pulled from the Multiple Listing Service and “while deemed reliable, is not guaranteed.” This includes public, MLS transactions only, no private sale data is included. 1. 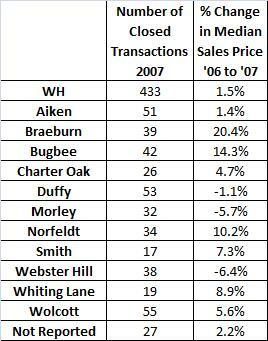 The median sales price is down 8% when comparing 2007 to 2006. 2. Homes are selling, on average, approximately 3 weeks faster when comparing 2007 to 2006. 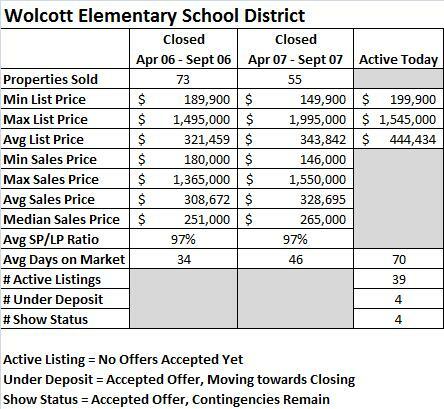 Sorry for the delay with my observations regarding the West Hartford real estate statistics, business exploded over the past few days. That’s a good thing! After comparing the single family residential sale statistics for the second and third quarters of 2006 to 2007, there are some interesting notes, particularly after breaking it down by school district. Braeburn saw the largest increase in MEDIAN price at 20.4%, while the Webster Hill district saw the largest decline in MEDIAN price by -6.4%. So while there were widely diverse increases and decreases, that didn’t translate into a meaningful change in the overall town. 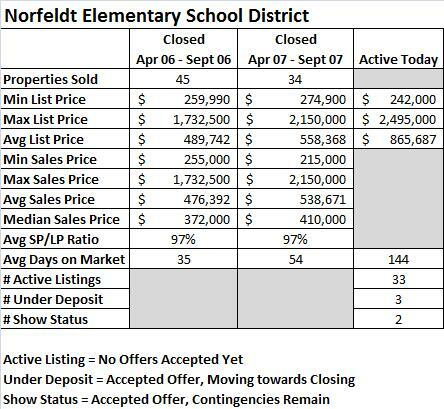 Last two elementary school districts for the West Hartford real estate statistics. I’ll provide some observations tomorrow.